Maggie Krol viernes, julio 29, 2016 12:33:00 p.m. Interesting post. I defiantly think the key to any relationship is communication and understanding each others wants and needs. With that also comes maturity, for some people it "easy" to hide behind a text or just hang-up and walk away. Someone who wants the same thing as you will not do that - they will fight for you, they will communicate and try to compromise regardless of the situation. Keep you head up! Be Strong! Paula Loreti lunes, agosto 01, 2016 4:35:00 p.m.
Anónimo viernes, julio 29, 2016 12:39:00 p.m. I think it's super brave of you to post something like this. My best advice is for you to learn that some people are like that, and that you don't always get a chance to talk. Good luck! Paula Loreti lunes, agosto 01, 2016 4:37:00 p.m.
Tessy Onyia sábado, julio 30, 2016 1:56:00 p.m. Breath in and breath out, you will be fine darling..We are here for you. Thanks for opening up..Sending you loads of hugs. Paula Loreti lunes, agosto 01, 2016 4:38:00 p.m. This is so sweet, thank you so much Tessy! Flor sábado, julio 30, 2016 2:14:00 p.m.
Uf. ¿A quien no le paso algo así? Creo que tendrías que hablarlo con las personas esas, la comunicación es super importante. ¡Suerte! Paula Loreti lunes, agosto 01, 2016 4:40:00 p.m.
Gracias Flor, creo que tenes mucha razon! Carina Vardie domingo, julio 31, 2016 3:17:00 p.m. I think you should try and talk with the person, see if you can understand what happened. If that's not possible than try to realise they don't function the same, but that's ok. You are very brave for opening up. Sending you lots of hugs. Paula Loreti lunes, agosto 01, 2016 4:41:00 p.m. I should do that, but it's super hard to do with this type of people.. Thank you so much for the support! Ela BellaWorld lunes, agosto 01, 2016 7:59:00 a.m. It is really hard to say why everything gets this way. As you said, it is weird that how people can change that much in such short time. Some are afraid of commitment and some just look around without any purpose, nowadays it is kinds hard to find someone who you can fully trust and rely on. Just follow your own way and I am sure one day there will be someone who will always be by your side! Paula Loreti lunes, agosto 01, 2016 4:44:00 p.m.
rae lovefromberlin lunes, agosto 01, 2016 12:32:00 p.m. I think that needing closure is a very natural feeling. We often need to have a finalized end to be able to actually move on. I would say you can try to reach out to those whom you need closure from and they may be open to talk, but sometimes this is not an option or the person will not agree, which in that case you need to learn to be able to give yourself the closure you seek. Paula Loreti lunes, agosto 01, 2016 4:47:00 p.m. I believe this is one of these cases where I need to find my own closure. It's hard but comments like this give me the courage I need. Thanks!! Dora Toubanaki lunes, agosto 01, 2016 3:46:00 p.m. Funny but I feel the same way! 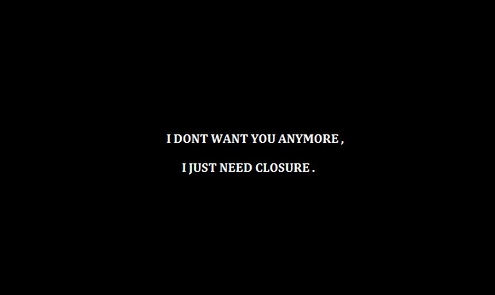 I need closure too! I cannot get how people feel things and then nothing at all! Those being friends, lovers..
You can never know what is in their mind or heart. Some people prefer to keep it to themselves and the sad thing is you might never know how they feel. Paula Loreti lunes, agosto 01, 2016 4:48:00 p.m. Totally!! Like, don't you need to talk it?! I guess it's how our personalities are, but life is like this and we can't change how people act. Rina Doria miércoles, agosto 03, 2016 4:54:00 p.m. I am so similar in that I need closure in my relationships to or even if there is an argument or miscommunication. I'm not one to talk about someone behind their back but rather approach that person with the issue and try to talk it out. Paula Loreti viernes, agosto 05, 2016 12:41:00 p.m.
good days jueves, octubre 18, 2018 9:21:00 p.m. Accident Lawyer miércoles, diciembre 26, 2018 11:10:00 a.m.